Even after ten years in the country, I am squeamish as can be about anything furry – dead, alive, or in-between. Once our dog killed a groundhog in front of the garage door and it remained there until my husband returned from a trip to his parents a couple of days later. My mother-in-law, on one of my hysterical phone calls, recommended to cover it with an old towel, then load it onto a shovel, but just approaching the thing sent me screaming. When it comes to protecting the new strawberry patch, however, I seem to be turning into a fearless, indelicate roughneck. The new commercial repellent I spread around the patch about a week ago seems to be working. But when I was weeding down there the other day and saw our dog lift his leg a few times around the patch, I had an idea. I had read somewhere that fermented human urine works as a critter repellent. Since we won’t be eating strawberries from the patch until next summer, and urine is sterile anyway, why not collect our own organic repellent? I sprinkled an old lemonade bottle full of donations around the perimeter of the patch twice this week. No rabbit damage so far! But the next worry is already lurking around the corner. When I bought strawberries from our neighbor yesterday, he complained about half of his patch being affected by fungus because he had sprayed only once this season. Of course, now I am wondering what else will I have to battle after the rabbit plague, especially because I want to grow the strawberries organically, like the rest of the garden. Enough kvetching, let’s get to the bright side of strawberries. Thanks to the healthy half of our neighbor’s strawberry patch, I was able to make another strawberry cake. It had to be something really easy and quick with the ingredients I had in the house, which was low-fat ricotta, but certainly whole-milk ricotta will make an even better, creamier filling. 1. Preheat the oven to 400 degrees F. Line the bottom of a 16 x 11-inch jellyroll pan with parchment. Grease the parchment and the sides of the pan. 2. Beat the eggs and the egg white until light and fluffy. 3. Mix the flour with the baking powder and the salt and sift into the eggs. Fold it into the eggs lightly but thoroughly until no more flour pockets remain. 4. Pour the dough into the jellyroll pan and smoothen it with a spatula. 5. Bake in the preheated oven for 10 minutes, or until golden and springy to the touch. 6. Lift the parchment with the sponge cake onto the kitchen counter or a baking sheet and cover immediately with a clean dry kitchen towel. Let cool. 7. Lightly toast the pistachios. Cool, then chop and set aside. 8. Beat the ricotta with the vanilla extract and the confectioner’s sugar until smooth and creamy. 9. Wash, hull and slice the strawberries. 10. Flip the parchment with the sponge cake over and place it on a large baking sheet lined with the kitchen towel or with parchment. Carefully remove the parchment from the baking of the sponge cake. 11. Spread the ricotta evenly over the sponge cake, leaving about ½ inch uncovered on the long sides. 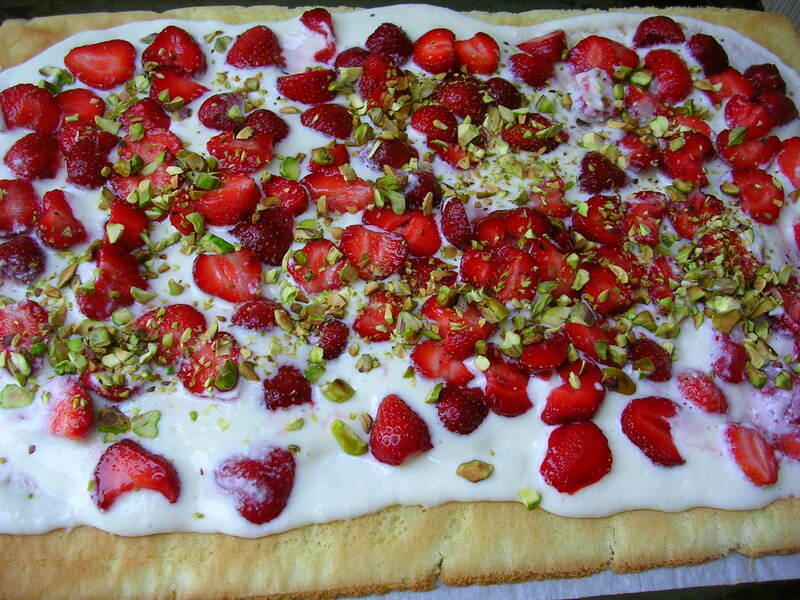 Spread the sliced strawberries on top and sprinkle with the pistachios. 12. Using the towel as a lifter, roll up the cake from the long side. 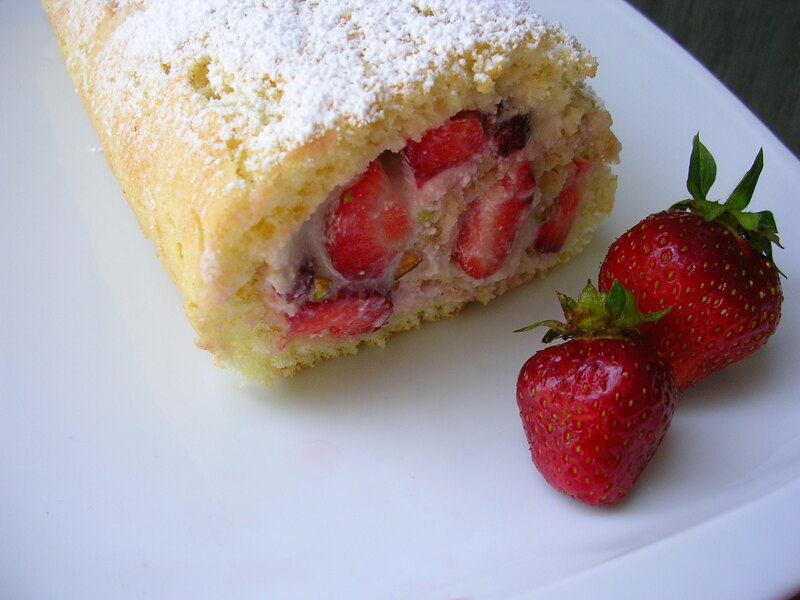 Place the roulade with the seam-side down on a serving platter. If you are making this just en famille, and not for fancy presentation, or if you don’t. have a platter long enough, cut it in half to fit, (that’s what I did). Chill for 1 hour. Dust with confectioner’s sugar before serving.